Acupuncture is the insertion of very fine needles on the body’s surface, in order to influence physiological functioning of the body. 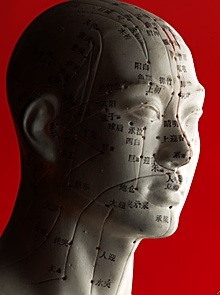 The first record of Acupuncture is found in the 4,700 year old Huang Di Nei Jing (Yellow Emperor’s Classic of Internal Medicine). This is said to be the oldest medical textbook in the world. It is said to have been written down from even earlier theories by Shen Nong, the father of Chinese Medicine. Shen Nong documented theories about circulation, pulse, and the heart over 4,000 years before European medicine had any concept about them. As the basis of Acupuncture, Shen Nong theorized that the body had an energy force running throughout it. This energy force is known as Qi (pronounced Chee). Qi consists of all essential life activities, which include the spiritual, emotional, mental and the physical aspects of life. The ancient Chinese believed it to be the basic substance by which all movements and mutations of all phenomena in the universe arise. In the context of medicine, it is considered to be the fundamental constituent of the human body. A person’s health is influenced by the flow of Qi in the body. If the flow of Qi is insufficient, unbalanced or interrupted, illness may occur. Qi travels throughout the body along “Meridians” or special pathways. These channels or meridians are pathways that carry Qi, blood, and body fluids around the body. They are communication lines between all parts of the organism linking every organ, tissue, muscle, bone and tendon, creating a unified whole. The acupuncture points are specific locations where the Meridians come to the surface of the skin, and are easily accessible by “needling,” Moxibustion, and Acupressure. The connections between them ensure that there is an even circulation of Qi, and balance between Yin and Yang. comprised of two parts, Yin and Yang. The concepts of Yin and Yang were devised by the ancient Chinese as a method of defining and explaining the nature of all phenomena. They had stated that all phenomena in the universe had both a Yin and Yang aspect. Any upset in the balance between the two will result in natural calamities, in nature, and disease in humans. Yin is signified by female attributes, passive, dark, cold, moist, that which moves medially, and deficient of Yang. Yang is signified by male attributes, light, active, warm, dry, that which moves laterally, and deficient of Yin. Nothing is completely Yin or Yang. The most striking example of this is man himself. A man is the combination of his mother (Yin) and his father (Yang). He contains qualities of both: This is the universal symbol describing the constant flow of yin and yang forces. You’ll notice that within yin, there is Yang, and within Yang, there is the genesis of Yin. In medicine, the concepts of Yin and Yang are generally used to categorize anatomical parts, physiological functions,and pathological conditions. This is a method of using very small electrical impulses through the Acupuncture needles. After a needle has been inserted at a point and needle sensation has been elicited, an electric current is passed through the needle in order to strengthen and alter the nature of stimulation. On occasion it is possible to apply the current through an electrode on the skin without the use of needles. Electro-Acupuncture is generally used for analgesia (pain relief or prevention). The first reported successful use of Electro-Acupuncture was in 1958 in China for a tonsillectomy. Today, it is a common method of surgical analgesia used in China. Ear Acupuncture is a modality used to stimulate specific points in the ear to treat various ailments. The theory is that since the ear has a rich nerve and blood supply, it would have connections all over the body. 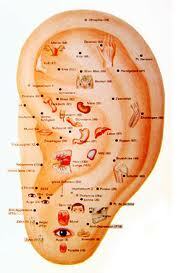 For this reason, the ear has many Acupuncture points, which correspond to many parts and organs of the body. Auriculotherapy uses the ear to help determine whether the right and left hemispheres of the brain are functioning as a dynamic whole, whether there are specific neurological, musculo-skeletal or organ systems that are in imbalance, and whether there are any blockages to treatment, such as scar tissue or emotional disorders. It is diagnostic as well as being an effective treatment tool. Auriculotherapy can be used to treat the same range of health conditions as Traditional Chinese Medicine. It is safe, comfortable and highly effective. It is important to note that painful conditions often respond very quickly to Auriculotherapy. There are numerous studies either completed, or currently going on which confirm Auricular Acupuncture’s effectiveness. 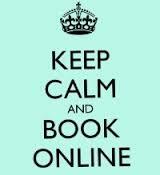 The treatment of diseases by applying heat and thermal stimulation to Acupuncture points. Acupuncture and Moxibustion are considered complimentary forms of treatment, and are commonly used together. Moxibustion is used for ailments such as bronchial asthma, bronchitis, certain types of paralysis, and arthritic disorders.